We have two games for you this week. Let's get to it. The first game for this week is Wonder Boy. 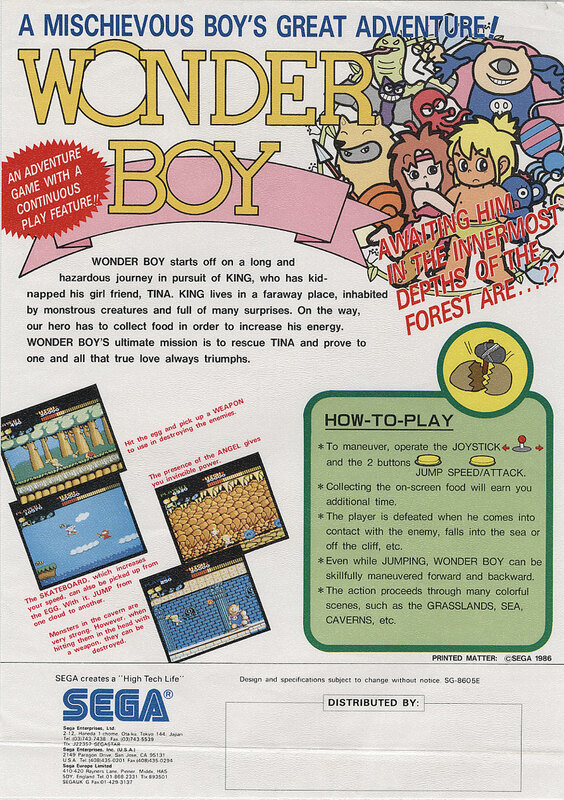 Wonder Boy was developed by Escape and published by Sega and was release in 1986. It is the first game in the Wonder Boy series. You play as Tom-Tom (Boy in Japan), you are on a quest to rescue your girlfriend Tanya (Tina in Japan) who has been kidnapped by King. To rescue Tanya you must travel to a far off land where King has your girlfriend held captive. But King and his minions will be trying to stop you at every turn. To reach your kidnapped girlfriend you must travel through seven areas. Each area consists of four rounds which can be made up of jungle, island, cave, cloud, locations. In these areas you will find yourself faced with Kings minions (Snails, Bats, Spiders, Wasps and more) which will kill you if touched. Also in the areas there are rolling boulders to squish you, fire to burn you and rocks to slow you down. You also have and energy bar you need to watch as it drains over time, also hitting rocks drains a bit of energy as well. Your energy bar can be refilled though by collecting the fruit that shows up in all rounds. Not everything is against you on your quest. In your travels you will find eggs which can hold one of a few things such as your stone axe (for you to throw at and kill your enemies), fruit, super food and an angle. The angel grants you with temporary invincibility letting you run through and destroy all enemies and obstetrical. You can also find a doll in each round which will give you bonus points at the end of the round and more if you complete the game. The dolls also unlock a secret eight area if you are able to collect all twenty eight of the and kill King. At the end of round four of each area you find your self faced against one of the many faces of King. King is immune to your axe unless you hit him in the head, you will need to hit King in the head many time before it falls off. You will need to do this while dodging Kings advances and his fire ball attacks. Once you knock off Kings head a new one will take is place and he flies away, he will also leave behind a item belonging to your girlfriend Tanya. Tetris is a falling block puzzle game originally made by Alexey Pajitnov but this version was released by Atari in 1988. In Tetris you take control of falling blocks, these blocks are tetrominoes (a tetromino is a shape made up of four squares that are connected orthogonally). The block drop from the top of the screen to the bottom at a steady speed and you are in control of the block until it collides with another. You are able to move the blocks left and right and you can also rotate the blocks to try and make a better fit with the blocks before hand. The goal is to try and clear a set amount of lines to complete the round. To clear a line you need to arrange the blocks you received (which are randomly picked) in such a way to have blocks connecting both sides with no gaps. you are about to clear multiple lines at once not just one at a time. Each time a block is placed you score a small amount of points, but most of your points will come from clearing lines. Clear one line and score 90 points, clear two lines and score 150 points clear three lines score 400 points and the max clear four lines (which is called Tetris) and score 900 points. 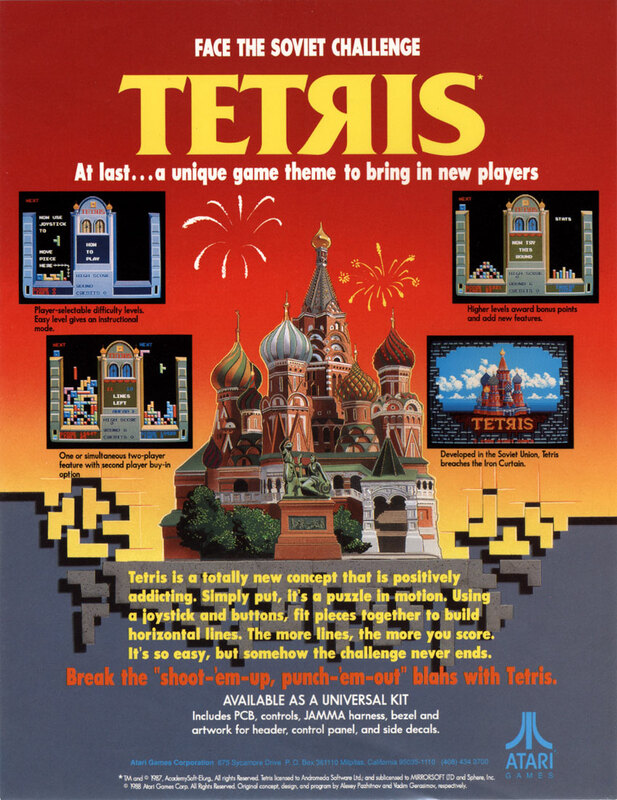 This version of Tetris adds new challenges for groups of rounds. Rounds one to three are just standard Tetris. Round four starts with eight vertical blocks on each side. Round five starts with ten blocks scattered in the bottom five rows. Round six starts with twenty blocks stacked in a pyramid shape. Rounds seven to nine start out empty but a single block will appear at a random location connected to another block at the top of the field. Rounds ten to twelve incomplete lines will randomly push up from the bottom of the field, this pushes all the blocks up one line. Rounds thirteen through fifteen start with blocks set in a patterns. Once past round fifteen the cycle starts again and continues until you lose the game.